As disciples of Jesus Christ we are a diverse and hospitable Catholic Community. We pray, serve and spread the Gospel with joy. Prayer is an encouraged daily practice embedded into the school day. Students are required to learn certain traditional prayers as a part of the religion curriculum. Students help prepare the liturgy which is celebrated every week, most typically on Friday mornings. Parents are encouraged to attend. All are welcome at the supper table of the Lord, and likewise, all are welcome to learn and worship with us. 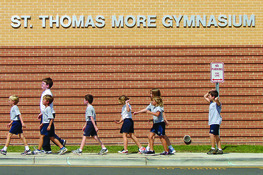 The sacramental life of Catholic children is an important component of the religion program at St. Thomas More Catholic School. Preparation for two sacraments, Reconciliation and Eucharist, is a core component of the second grade curriculum. All students Catholic or non-Catholic are encouraged and to enjoy fully all the traditions and practices of Catholicism. However, only those who have been baptized and celebrated their first communion will receive the Eucharist during our weekly Mass. Is your family curious about or interested in joining the Catholic Church? Our RCIA coordinator, Deacon Bob Troy, can answer all of your questions at 919-942-6235. Every day, students and families are expected to serve their neighbors in small ways as Christ has guided us to do. Throughout the year students will be invited to participate in local, regional, and/or worldwide service projects. One example of a whole school service project is the support of our mission in Arenal, Nicaragua. The school and parish has raised over $110,000.00. Click HERE for more information about this mission. Middle School students are encouraged and supported in their efforts to develop, lead and facilitate service for others, both at school and in the community. One way we support this effort is through our annual Service Fair. Community agencies are brought in to meet with middle school students and parents to discuss how students can play a role in our larger community, while giving the students a chance to choose an area of service that interests them. Each year in late January/early February, Catholic Schools Week is celebrated across our nation. This is a chance to celebrate what makes a Catholic education so special and unique as well as celebrating what Catholic schools do for local communities and our nation. A special service project is included as part of this week.